Facebook Lead Ads easily connect to HubSpot. To import your leads generated from Facebook into HubSpot, connect your Facebook Ads Accounts you want linked to HubSpot within ads settings. Click here to go to settings. The minute you authorize Facebook in settings, new leads generated from Facebook Ads and synced with HubSpot. 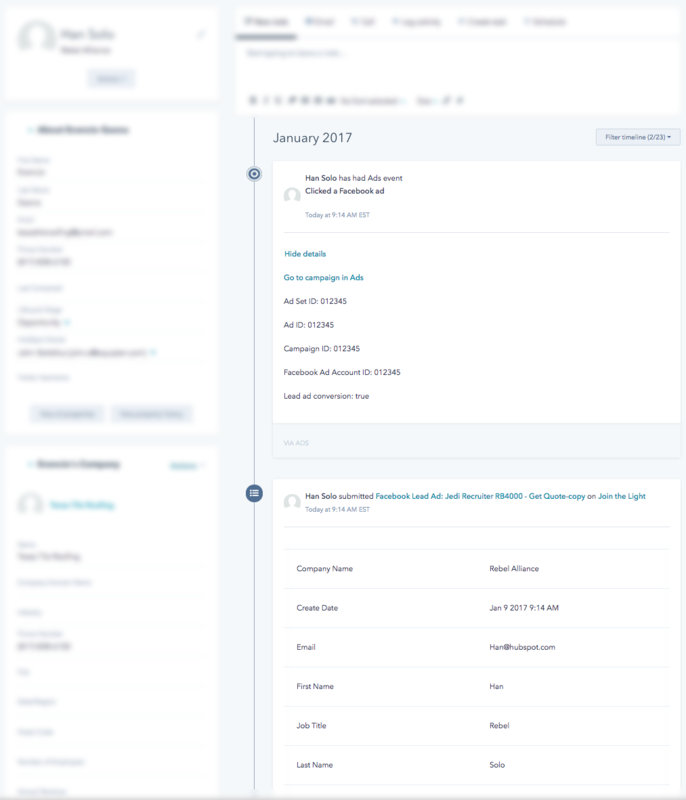 A form event is created inside HubSpot (keep reading) and all the data from your Ad Campaign is added to the contact record. This allows you to create lists and segments of leads based on your Facebook Lead Ad campaigns. You'll only get this functionality from the official HubSpot integration. Third party integrations can't do it. If you're using Facebook Lead Ads - it's important to take advantage of this integration. It'll allow you to start nurturing the leads you generate right away and data shows that faster you start nurturing or contact a lead the more likely it will close. Besides lead import, HubSpot Ads will automatically show you the conversions your ads generated. And because the tool ties them back to the ads the came from, you'll see the ROI of all your campaigns and individual ads. We do this with a connection to your CRM we call deals ROI. This connection will give you a level of accuracy for deals that close with a salesperson that isn't available from the actual ad networks. To learn more check out the Ads integration product page or watch this short video.